Welcome to my "Ranking, Rating and Score" article for the coming week. The article "Strength and Comparison" has also been published. 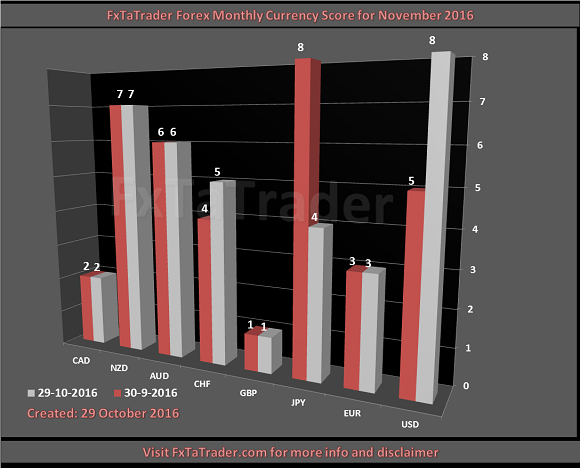 In the Top 10 of the Monthly Ranking and Rating list for the coming month the following stronger currencies are well represented for going long: USD(3X) with the NZD(3X). The weaker currencies are the GBP(6X) followed by the CAD(2X) with the EUR(2X). GBP/NZD, GBP/USD, GBP/CHF, NZD/CAD, GBP/AUD, GBP/JPY and EUR/USD. 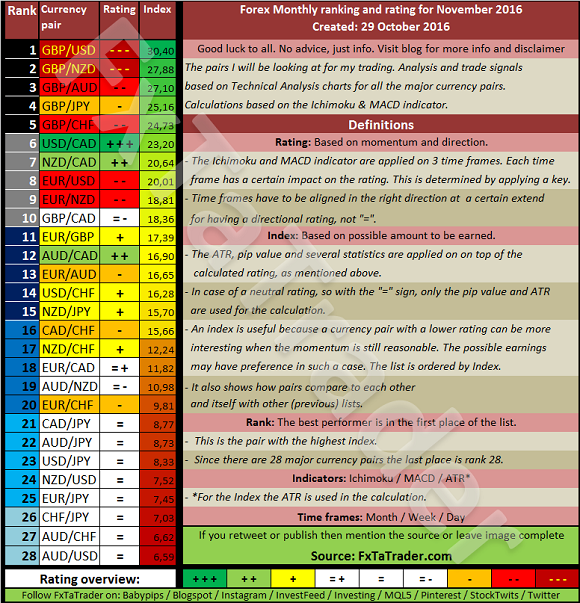 For the GBP pairs the GBP/NZD is the most interesting not being yet in the overbought/oversold followed by the GBP/CHF which is a little bit in that area but may stay within when the new month starts. The GBP/USD is in extreme overbough/oversold area according to the monthly chart using the Bollinger Band(20). Strong overbough/oversold areas in the Monthly chart may still offer a good opportunity but the pull back may be strong! When trading with more than 2 micro lots it is a good idea to have a diversification and depending on your preferences it may offer opportunities by going long or short on a specific currency trading it against other currencies.